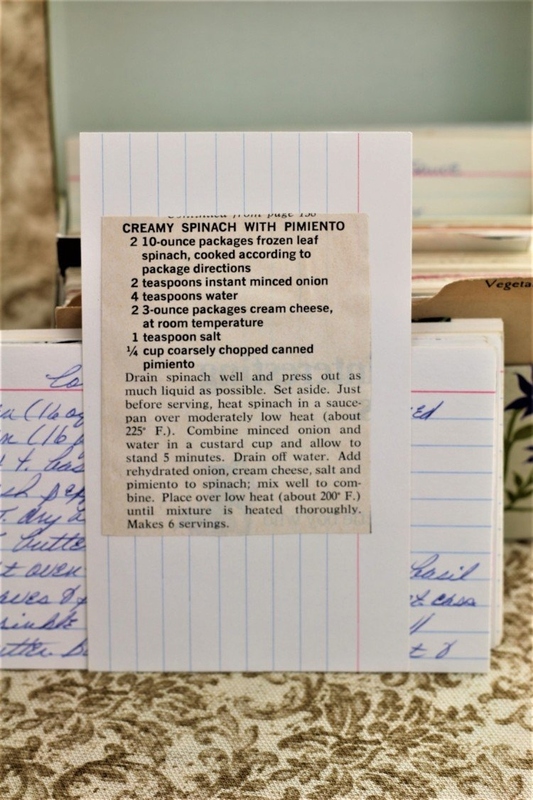 Front of the recipe card for Creamed Spinach With Pimiento. 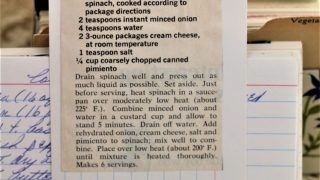 There are lots of fun recipes to read in the box this recipe for Creamed Spinach With Pimiento was with. Use the links below to view other recipes similar to this Creamed Spinach With Pimiento recipe. If you make this Creamy Spinach With Pimento recipe, please share your photos and comments below! Drain spinach well and press out as much liquid as possible. Set aside. Just before serving, heat spinach in a saucepan over moderately low heat (about 225° F.). Combine minced onion and water in a custard cup and allow to stand 5 minutes. Drain off water. Add rehydrated onion, cream cheese, salt and pimiento to spinach; mix well to combine. Place over low heat (about 200° F.) until mixture is heated thoroughly. Makes 6 servings.